SUBSCRIBE NOW! Don't miss our newsletter. Join our email list TODAY! This marvelous Martha market bag is a total must-have! The gorgeous piece is the perfect accessory for busy days out on the town. It is fashion and function in one beautiful piece! In fact, this project is ideal for crafters with intermediate to advanced sewing skills. Once finished, the Martha market bag should measure approximately 20 inches (51 cm) wide by 15.5 inches (39 cm) high. This gorgeous market bag is a wonderful design by the talented designers over at I Think Sew. In fact, you can access the FREE downloadable pattern for this bag from the Craftsy website. To access the FREE downloadable pattern, please click on this link: The Martha Market Bag. You will need to sign in to access the pattern. 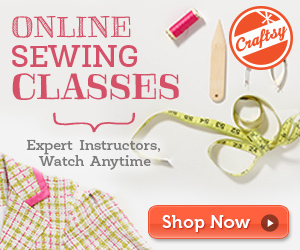 If you have not already joined Craftsy, you can JOIN FOR FREE. Featured image: ithinksew.com/ Craftsy – thank you! This website contains affiliate links. When you make a purchase through these links, we receive a commission. This small contribution helps support the Not Just Crafts Blog and allows us to continue to bring you more articles, etc. Not Just Crafts Copyright © 2019.